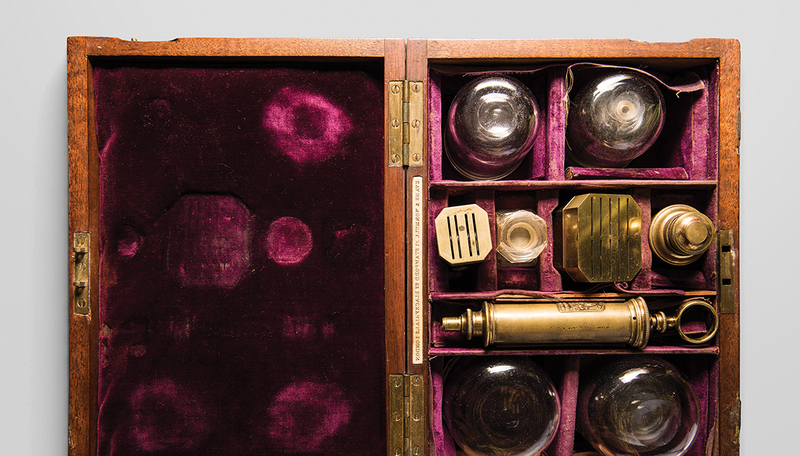 This cupping set from 1875 is housed in a mahogany brassbound case containing nine cupping glasses, four-blade and 12-blade scarificators, an alcohol lamp and a cupping syringe. The cupping method of phlebotomy, used by physicians during the beginnings of modern medicine in the 19th century, utilized suction to blister the skin before it was lanced. Blood was then drawn from the capillaries rather than from a single vein. This method, though a bit more sophisticated, was similar to other methods of bloodletting, which can be traced back to third century B.C. in Egypt. The set is part of the George E. Wantz Collection and is on display in the lobby of the Simpson Memorial Institute building.